Landon Cunningham's 9th birthday celebration and first trip to a Major League baseball game changed from near disaster to relief in a split second, all thanks to his hero dad. 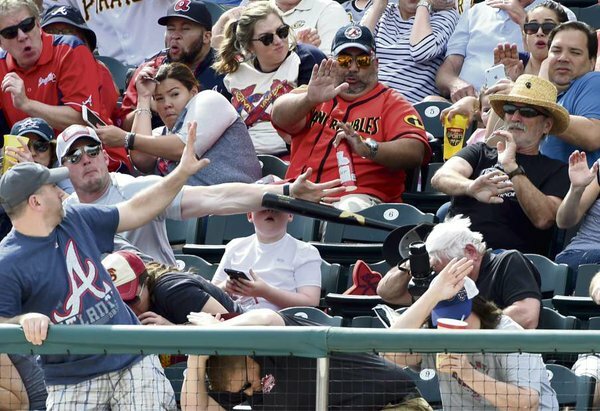 Landon was looking at his phone while texting his mom a picture from Saturday's Pirates-Braves spring training game when Pittsburgh outfielder Danny Ortiz lost control of his bat at the plate. That sent the bat hurtling into the stands behind first base, directly at Landon's face. #Pirates OF Ortiz: "My wife said to me, 'You almost killed that kid!' "
At the last instant, his father, Shaun Cunningham, stuck out his arm to block the bat from hitting his son. “It happened so fast, I didn’t have time to think about it. Once I realized that, in fact, it was heading for us, specifically my son, I just threw my arm out and tried to block it the best that I could”, said Shaun. Cunningham and his son, Landon, had gone to the Pirates-Braves game as a birthday present for Landon, who turns 9-years-old next week. “I was just about to send it when I felt something hit me and I didn’t even know what it was. It went flying and it hit my shoulder”, said Landon. While Landon did get hit in the shoulder, it was his dad who took the brunt of the bat’s force, but both say they’re no worse for wear.